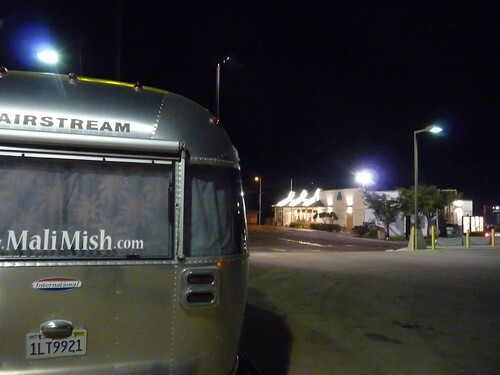 Mali Mish – Day 106: Getting our kicks on Route 66. This morning we said good bye to our friends, old and new, and headed back out on the road after a 4-night stay at Tenkiller Lake. We are hoping to get lots of miles down the road today and no one is really looking forward to the long drive. 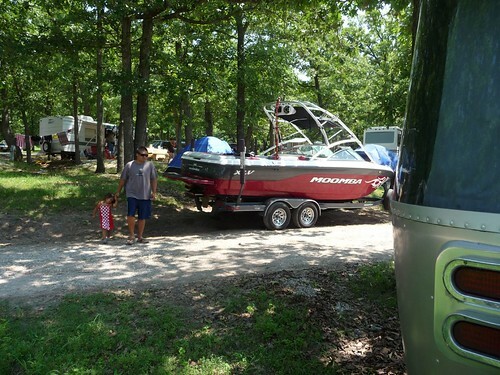 Tenkiller Lake is near the eastern part of Oklahoma about 150 miles from Oklahoma City. Since we spent time with Fred and his family at the campground, we did not plan to spend any time here. 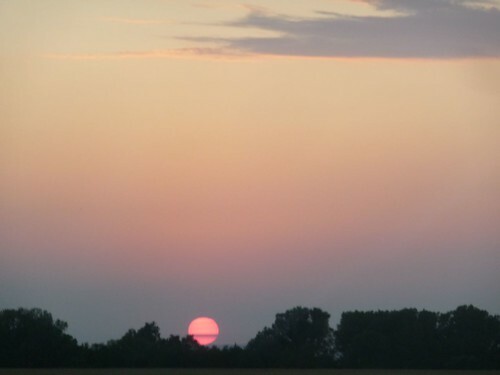 After a couple hours of driving, we took a break just outside of Oklahoma City at a suburb called Midwest City right across from Tinker Air Force Base. 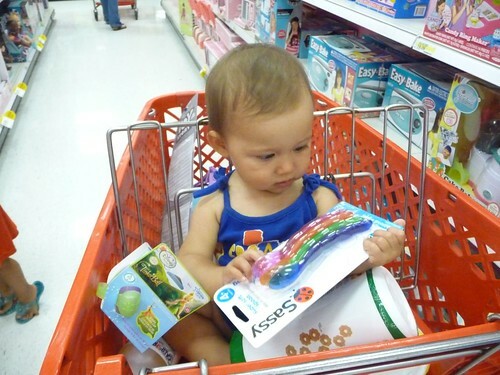 We stopped at the Target to do some shopping and Ava loves going down the toy aisles. 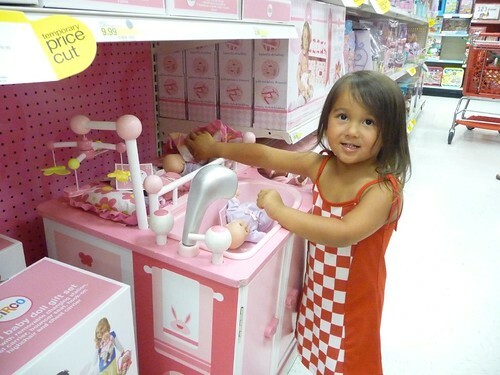 She is especially fond of the ‘girl section’ as she likes to call it. Look at these babies taking a bath! 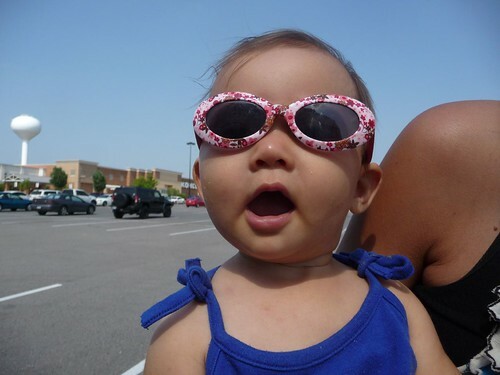 Mila got some spoons and a big tub of organic baby puffs. She just loves this stuff. It’s like baby crack to her. 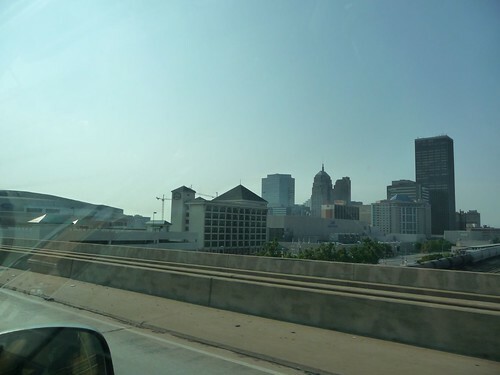 We drove right through downtown Oklahoma City and this is the only view we had of it as we sped past on I-40. A long day of driving always includes stops at fast food joints for quick meals. 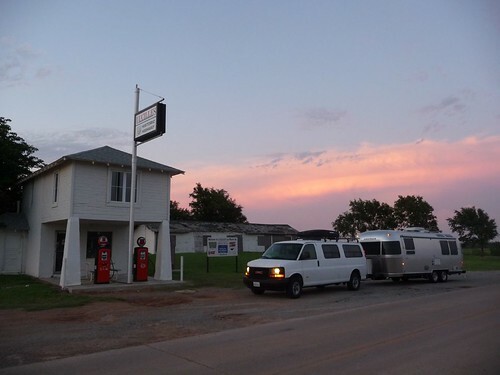 As Oklahoma was zooming by us in the rear view mirror, we decided to stop at Yukon, OK for a bite. 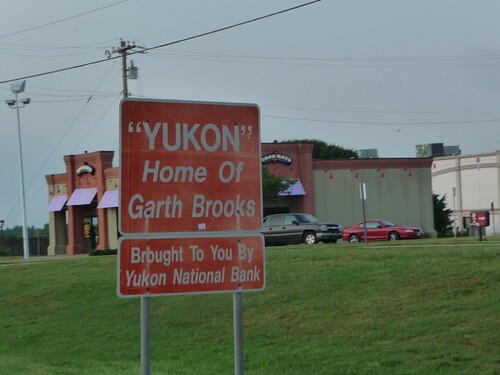 It just so happens Yukon, OK is also the home of Garth Brooks. The record breaking country singer grew up right here and started his singing career with talent show nights at his childhood home. Look at this awesome picture. 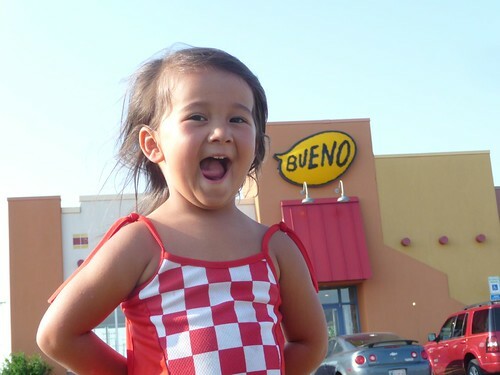 As we looked for a place to eat, we saw the Bueno Mexican food chain and we could not pass up this photo opportunity. BUENO!!!! After dinner at Bueno, we continued west on I-40. 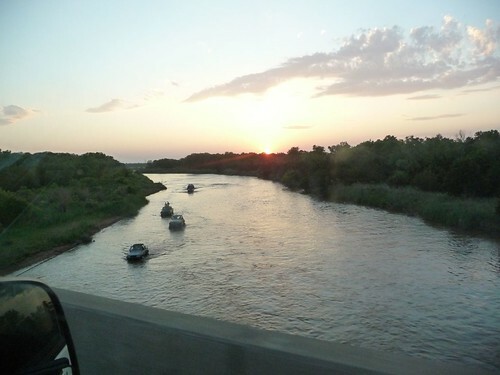 While taking pictures of the sunset, Marlene got these guys driving their Jeeps like boats. These Okies sure know how to have fun. 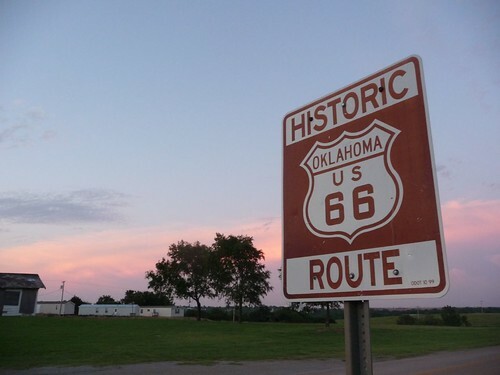 As we drive on Interstate 40 past Oklahoma City, it parallels right along the famous Old Route 66. The original road that connected Los Angeles, CA to Chicago, IL. Route 66 connected the Main Streets of all the cities along the way and was the king of the road in the glory days of road trips. Since we are now going to be following Route 66 all the way back to California, we decided to check out as many of the historical landmarks of the old road as we could. 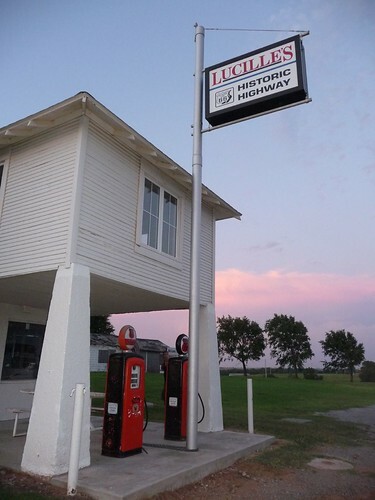 A few miles past Yuko, OK, is an old gas station that has been restored to its original glory called Lucille’s. The Historic Route 66 has been facing a slow demise ever since the construction of Interstate 40. Much of the old road is now dilapidated and no longer maintained. Many of the towns that once thrived by catering products and services to travelers have now become empty shells of its former self. Even though Lucille’s is now restored, it is just a non-functional facade basically made for picture taking. A peek through the window of Lucille’s you will see that it basically just stores the left over materials that were used to bring the structure back to its current shape. We drove until late into the night and finally made it to a small town called Shamrock, Texas. Tomorrow morning we will get to check out another Historic Route 66 landmark before heading on to New Mexico. Day 107: Cars and the Big Texan. One Response to Day 106: Getting our kicks on Route 66.